During my summer travels, I was able to study a herd of buffalo near my cabin. I really enjoyed watching these massive beasts graze the mountain meadows...they were still shedding their winter coats. This painting was done with brush and palette knives, size 18x22. Available for purchase. Fly fishing gets a bit more challenging when the calm morning mists burn off and the slightest breeze starts to nick the water surface....but, gosh, it is still really a great place to just be alive. This painting is 18x22, lots of surface action in the paint, primarily palette knife work. Currently drying in the studio. Available for purchase. I saw many elk this summer in Colorado...very up close and personal...they were huge!...well, ok, at least much larger than me...and majestic, elegant creatures. It was amazing to watch them move thru the meadows...and around town, and across the street...They are big enough to go damn near anywhere they want...traffic just stops, and you wait...works for me. This painting is drying in my studio, 48x36x1.5 gallery canvas. Available for purchase. 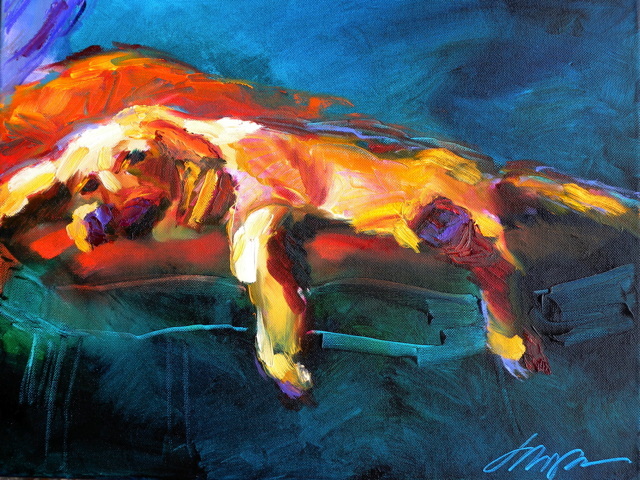 This is Ella, the precious pup whose human is my friend, Gail....Both were at the studio not long ago and Ella was waiting so patiently...well, maybe not, but I painted her quickly. I love that she has one crystal blue and one golden brown eye...she must possess special powers! Not for sale. Yes, I do pet commissions! The kings of the prairie are one of my favorite subject matters...seeing herds of these majestic beasts is a real treat. I was recently able to photograph the herd near Evergreen, CO, on a beautiful summer day...lots of great reference material. This painting is 30 x 24 x 2.5 on extra deep gallery canvas, currently drying in the studio...heavily painted, mostly with palette knives. I hope you can feel the grasses in the meadow... available for purchase. I love dogs....they are the only creatures on earth who love us more than themselves...they exist solely to bring joy to our lives. I firmly believe there are no bad dogs, only bad people. These two are living the good life, with good people, no doubt....just napping the day away. Oil on gallery canvas, 12x24x2.5, available for purchase...commissions inquiries for your pet portraits welcome. A recent visit to the Dallas Arboretum inspired this painting of the lily pads blooming in one of the water features. The sun was dancing on the water, and the flowers lifted their heads to enjoy the day. This painting is thick w/ paint, done with brush and large palette knives. 22x28, oil on canvas. Currently displayed at The Dutch Art Gallery in Dallas, TX, it is available for purchase. This bear is on the prowl for lunch...maybe headed to the stream for a little fishing??? (my bears like to fish!) 20x20, oil on canvas, very heavy paint application w/ palette knives. Available for purchase. I've been doing a series of bears fishing...they are usually more successful at this than me. I like the movement of the water and attempting to catch the moment. This painting is 12x24. The most amazing thing happened while at the ER with my mother this week (yes, she is fine) ....I was on my way to the studio last Wednesday morning when a doctor phoned and said Mom needed to go to the hospital for tests and that we should come to the ER. So I diverted to Mom's, picked her up, and headed to the hospital....against her wishes....she was very unhappy that I was going in my painting clothes! Gasp. They were clean, but had (you guessed it) spots of paint all over. Nevermind. We were admitted and shortly a Dr. Nelson came and administered to Mom. Then, he looked up and said, "Oh, you must be an artist...Do you happen to know Hans and Pam Massar?" me: "Yes, I do, they are my gallery representatives here in Dallas, great people. Do you go to their gallery?" him: " yes, frequently...in fact, my wife and I bought the most wonderful painting there recently...let me show you, I keep a photo on my phone!!! We really love this painting, it just lights up our home. 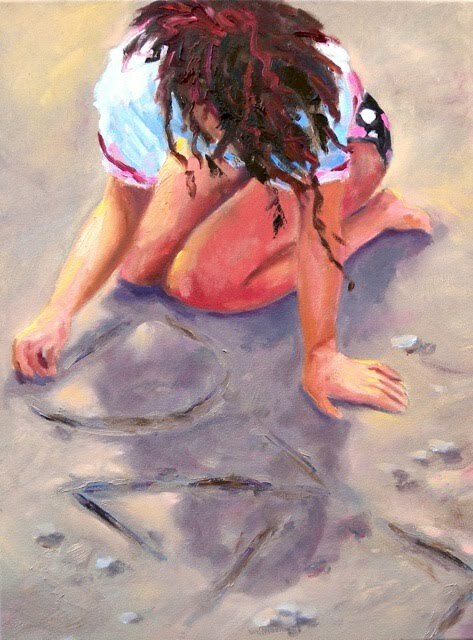 I am embarrassed that I can't remember the artist's name, but we love the painting." me: "Do you happen to live near Hans and Pam?" Him: "Yes." He finds the photo and is showing it to the other drs and staff. me: "I think I can help you out....that artist is Sharon Hodges and she looks exactly like me!" hahaha! You can imagine the rest. What a total joy to meet someone who has purchased a painting and really loves it. This was a major piece for me...it is 44x44....and all because I wore my painting clothes to the ER. :)) Life is good. Hmmm...wolf in the woods, I would hope that I see him and that it is a mutual respect thing. This is a small sketch in anticipation of a larger painting. 5x7, oil on panel $150. Please contact me if interested in purchase. Another bear out for a quick meal...still experimenting w/ techniques to render the water. 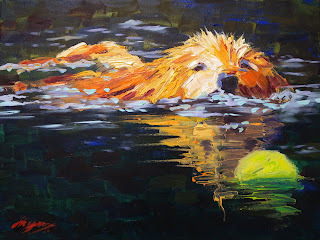 Bears.....I am painting a series of bears, mostly fishing for salmon. If you have ever had the good fortune to see this, it is really a staggering experience. Thankfully, the bears are more interested in the salmon than the people, and the salmon are plentiful, and that is a very good thing. I want to show the force of the water, the power of the bears, and the determination of these salmon...some of whom lose their uphill battle to the bears, but many more manage to return to their original nesting grounds to spawn and die...quite a life cycle. This is not a great photograph, but this painting sold and this was the only photo I have. Late summer field of sunflowers, painted from last year's trip to Provence. This just brings back good memories of some beautiful lazy days in a lovely area. Dogs have a way of flopping down and making themselves totally comfortable...that deep, shoulder slumping sigh before they fall fast asleep always makes me jealous of their pure contentment. That is what I am trying to capture in this snoozing canine. Yikes, these rival wolves have issues...don't we all? 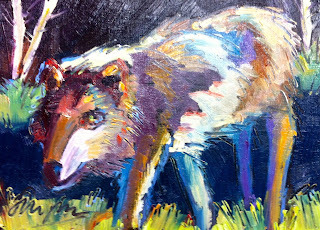 I am enjoying painting animals, and thought I should post a few of these efforts. Trying to render fur in all its different forms is challenging. I still want to paint loosely and will always take some liberties with color...16x20x1.5, oil on gallery canvas. 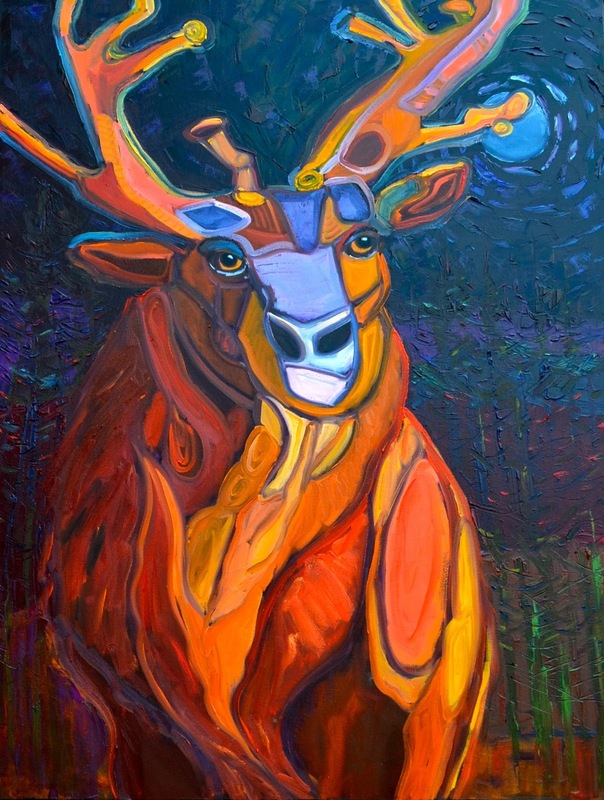 For more information, email me: sharon@sharonhodgesfineart.com. OK, so I am taking a life drawing class....I hated figure drawing in college...maybe because it was at 8 in the morning? Whatever, but I have never liked figure drawing, all the while totally believing that it is a necessary foundation for any artist. Ok, so I thought I would force myself to pay for the class and endure it. Lo and behold, I really love this class. Go figure (pun not intended). The next step is unavoidable for me, and that is putting those drawings to canvas and adding paint. What is a painting anyway but drawing with a brush, and then 'pushing' it with color? So, here we go...it is a learning curve, to be sure, and there is much to learn. I know, for example, that I have taken liberties with the hands and feet in these two paintings of Rhia...and, frankly, also in the thighs...she is very thin...I never aspired to be a realist, but I would like to get the gesture and the feeling commuted from my eyes/hand to the paper or canvas...so we will see how that goes. Feel free to comment positive or negative, I am open to all opinions. Thanks for looking! If you have interest in purchasing these or other works, please contact me. This triptych is another in the 'ripped from my sketchbook' series, thus the ragged edge motif at the tops of the canvases. Does that work? or not? The modern landscapes do work as stand alones, as diptych, or triptych, depending on your preference. This came up after I took my dog for a outing in a new park. I am always amazed at what she sniffs out that I never even see, stuff that I would just pass right over, but that she is completely fascinated with...she is easily entertained and so happy with every scent that passes her way. Simple pleasures. I recently enjoyed a short trip thru the central Texas hill country, hoping to see field after field of our native bluebonnets. I saw exactly three....bluebonnets, not fields and fields. :( It was a bit early and it has been dry. Nevertheless, the sun was warm, and I saw wonderful rocky outcroppings and glowing grasses, and meandering streams, the promise of a beautiful spring on its way, and I had to paint that feeling of the earth warming up after the cold winter. (In a few months, we will be begging for those cold breezes, yes?) This painting is loaded with paint, thickly applied, lots of active brushwork. I will post it on my website with the zoom enabled for better viewing. This painting is currently displayed at Dutch Art Gallery in Dallas, TX. Contact me for more info. Thanks for looking at my work! I woke up with different brain cells firing today....and this is what came off the easel. Who knew? Definitely more abstracted than recent work and alot of fun. I may expand this as a series of paintings 'ripped from the pages of my sketchbook'. I love how paper looks when it is ripped off of spiral bound books...especially heavy drawing paper. This is painted with oil paints and oil sticks, like giant crayons. I LOVE those. Please visit my website, and contact me if your are interested in this or other paintings. 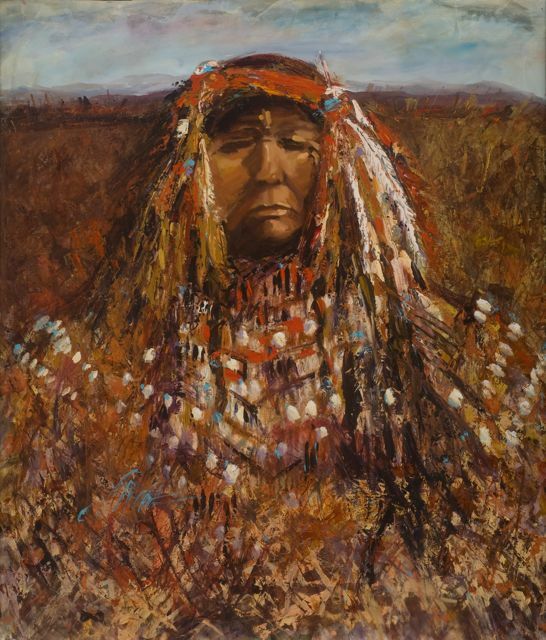 My goal here was to show the proud native American Indian woman rising from the prairie...ok, so I got really carried away with all the textures and the layers of paint...if you don't believe me, look at this painting on my new website and use the zoom feature. I do love lots of paint. The feathers may be my favorite part, just layers and layers of bits of color. And I love the strong features of this figure. Painting faces is always challenging , but I am pleased with this one's expressive bearing...I'm going to keep working on this series. This painting is large, it stretched to 54x48, on gallery stretchers. Please contact me if you have interest in this work, and thanks for looking! I have always been intrigued with the first Americans, the native Americans, and stories of their lives were my favorite reading subject as a child. I often chose to write my school reports about these peoples, so it may not be surprising that I have finally chosen to paint this subject. It is intimidating. I am particularly interested in native American women, who had more critical roles in daily tribal life than many of us would ever have imagined. While I am not in a position to render a great deal of scholarly information on the subject, I am enjoying painting these women...they are strong featured and often have interesting clothing and ornament. This painting is 44x44, currently mounted on gallery stretched canvas. If you have interest in this painting, please contact me. Please also visit my new website. This painting can also be seen on page 64 of the April 2011 Western Art Collector magazine. My husband and I were guests of our god-daughter's family last summer at Sea Island, GA, for a wonderful beach vacation. My favorite photo from that trip is of our god-daughter, Liza, when she was playing on the beach, writing her name in the sand. As this posts, Liza will be the flower girl in my oldest niece's wedding, so we will all be together in Florida for the big event. 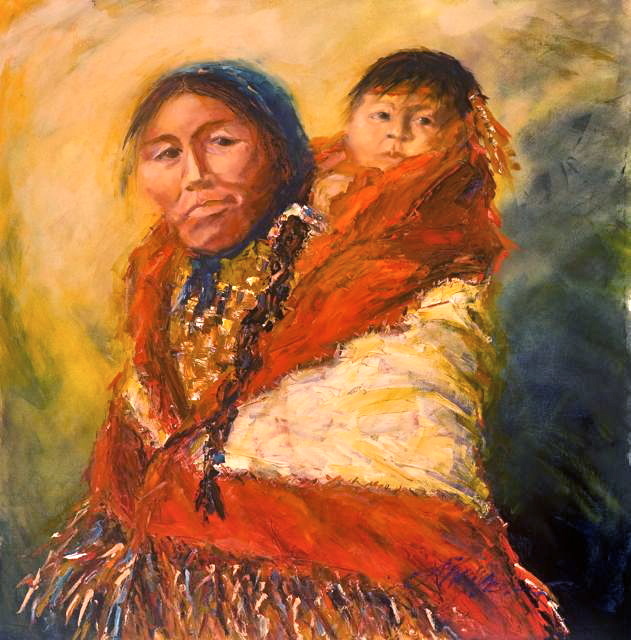 This painting is a gift to Liza's parents. If you have interest in other paintings or commissions, please contact me. 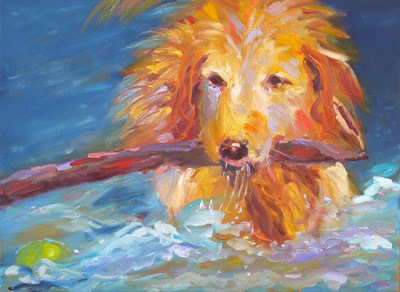 If you have ever been blessed by a retrieving canine in your life, then this is a familiar and happy scene. 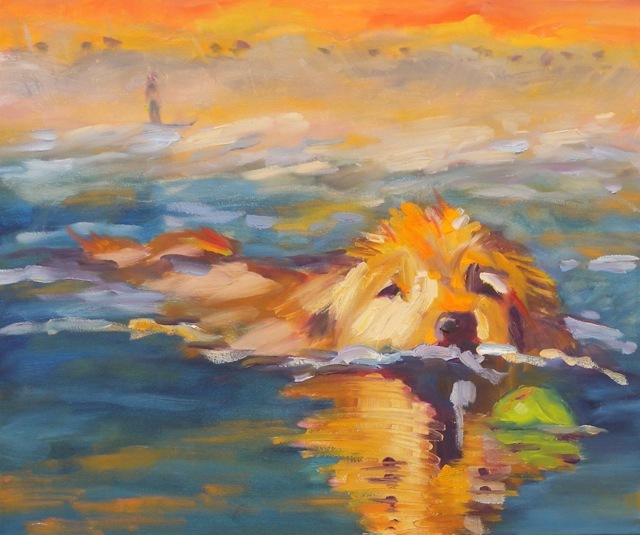 This golden will swim thru the waves for her tennis ball for hours and hours and hours. Her 'person' (my dear friend, John G) waits on the beach to throw the ball yet again. I was trying to paint this from the dog's vantage point...had to borrow the neighbor's retriever for photos, as my own beloved labrador didn't get the memo that she hails from a long lineage of water loving champion retrievers. (She hates water and wouldn't even be tempted if I threw a steak out there!) Dogs are a favorite painting subject for me...it is possible that I like them better than many people, at least I understand them better. Yes, I am still painting the large beasts of the western plains, albeit not in their native colors. My buffalo(s) are turquoise/ lilac, orange, etc, and it makes a good contrast to the early winter grasses, yes? 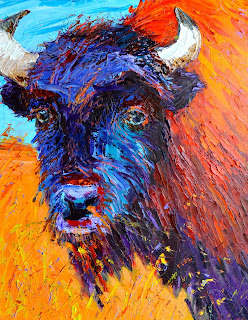 I like the repetition of the hulking form, and would like to paint it larger, much, much larger...a herd, large herd of multi colored buffalo.....Thanks for viewing my work. If you are interested in purchasing this or any other painting, please do contact me. Many thanks to friend & fellow artist Mark Malone who shared his photographs of buffalo from a recent trip to New Mexico. I've always be fascinated with these beasts...particularly their mass, their bulk, their texture. They are just great big hulks of power and texture. I like that. This particular buffalo was on a fenced ranch, and somehow I suspect he might not have appreciated that fence, but he at least accepted it for the moment. Please contact me if you have interest in purchasing this or other works. OK, loved painting this still life.....and definitely need to paint more of them. Sometimes I think that the still life genre sounds so very boring, but honestly, I just loved doing this. I realize that the 'real' items are more 'still' than my brush work, but it is the brush work that brings it to life for me. Sold. Thick paint, this may not dry til next year....but I like where this is going....it just feels right. It began from an old photo taken at the Chama River in New Mexico. The topography there is so wonderful...it is no wonder so many artists live and work in that area of New Mexico. 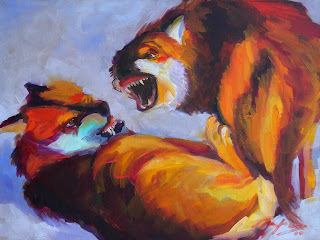 I want to make more paintings in this genre...I just like the way the paint feels. If you are interested in purchasing this painting, please contact me. I am enjoying painting with lots of luscious, heavy paint.....it really is all about the paint. Something is changing in my painting. We will just see where this goes. Sold. Friend Julie and family enjoyed a fabulous summer vacation in Barcelona, Spain. They were guests of a family and stayed on their estate outside the city. Evidentally, they were royally entertained and wanted to give the host & hostess a special gift. Julie sent me a photograph of the hostess, Ava, and her little dog, while they were resting on the veranda hammock. She asked me to paint the scene, and this is the result. So, this is Julie's thank-you gift to Ava and her husband! So much better than flowers or wine, yes???!!! This is a small work on panel, a study of cactus found along the river's edge last summer. My studio group is mounting a show at the Texas Discovery Gardens at the Texas State Fair. The show will be on display thru December 31, 2010, so if you go to the State Fair, stop by and see the show. The art show is free, and the building itself is wonderful, as are the fabulous gardens, and the Butterfly Exhibit. If you are interested in purchasing this painting, you can do so at the Texas Discover Gardens, or just contact me. 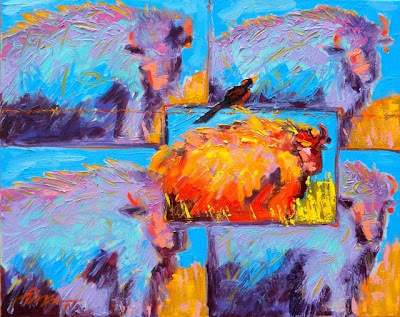 This painting was commissioned after the client saw another work "Just a Country Song Waiting to Happen" which is on display at the Dutch Art Gallery, Dallas, TX. Both paintings have a beautiful dress in common, but then they part ways. This painting is rich in symbolism telling a story of many important events in this couple's life together. The client requested that the painting contain the special dress, the colorful bow-tie that was worn by the groom at their wedding, and a special piece of jewelry, and a representation of their wedding date. I chose to perch the dress form's magic melon on a tight rope (because balancing marriage, career, family is like a tight rope, yes? ), the melon being a fertility symbol. The eggs in the bird's nest represent the couple's children, and the nest the safety of their family. The groom's jacket hangs from the jungle vines (the jungle representing the challenges of his professional career). The yellow bird holds a scroll with their wedding date in the Roman calendar. A humming bird holds a strand of pearls representing one of the many pieces of jewelry the husband has gifted the wife for special occasions throughout their marriage. The blue dragonfly is a symbol of the warm hospitality that this couple continuously offers their many friends and family members. It was a challenging and rewarding commission. I was honored to work with this couple on their special painting! I totally love dogs and their consistent excitement about every little thing. This golden retreiver, like most, LOVES to chase her tennis ball...every time is like the first time. I hope my painting captures a tiny bit of that joy. I guess painting dogs, as subject matter goes, may not be considered 'high brow art', but I believe the human species would be alot happier if we approached our lives like dogs approach theirs. I will likely paint more dogs. This painting is gallery wrapped linen, finished edges, so no need to frame. If you are interested in purchasing this painting, please contact me. Thanks! Hmmmm...the second of the current sun goddess series. She looks uncomfortable to me, but I can't sit still long enough to sunbathe, so what do I know? I am painting on linen w/ clear gesso, which allows the grey-taupe tone of the linen to show thru. I am experimenting with leaving some of that canvas unpainted. This is gallery depth linen, so no need to frame. If you are interested in purchasing this painting, please contact me. These beautiful cows were enjoying a sunny day in south Texas. The light was crisp, and I liked the shadow shapes. This is oil on natural linen, gallery depth, no need to frame. If you are interested in purchasing this painting, please contact me. Spring is busting out all over, and we are really enjoying the fresh fruits right now. This is a small study, oil on linen, framed in a beautiful carved frame, silver finish....great Mother's Day gift???? If you are interested in purchasing this painting, please contact me. I totally love parades, and especially the bands...all of them, especially the giant tubas which remind me of stampeding elephants (and frequently sound similar to the pachyderms, ahem). It takes a special person to play a tuba, don't you think? This piece stands on its own, or completes a triptych of the Memorial Day Parade pieces: see prior posts of 'Memorial Day Bagpipers' and 'Canines on Parade'. All are painted on gallery depth canvas, completed finished to the edges, so no need to frame. If you are interested in purchasing this painting, please contact me. A great diner is one of my favorite things. This one is in Dallas, owned by a friend of mine, and is just a great place for food and friends. The strong morning light through the back windows added an interesting touch to this composition, making all the condiments look like mini-landscapes (well, that's how it looked to me!). If you are interested in purchasing this painting, please contact me. Would you like to receive my latest painting via email?